Amultidisciplinary approach toward the complete healthcare of a patient is the talk of the moment. It is seen that in most of the diseases, including certain oral conditions, the first contact for most of the patients is usually with a general medical practitioner. However, a gap between the integration of medical and dental care in our country is quite evident, and requires the attention of both the faculties. , Also, for more than 40 years, postgraduate training in Oral Medicine and Radiology has been available in our country. This specialty focuses on the diagnosis and treatment of oral mucosal lesions, treatment of medically compromised dental patients, and maxillofacial, oral, and dental imaging. Hundreds of such specialists are registered with the Indian Academy of Oral Medicine and Radiology. However, unlike other specialists in dentistry, it is not routine for a medical practitioner to refer patients to a specialist in Oral Medicine and Radiology. Is it because such a need does not arise frequently? Or the need does arise frequently, but specialists are not available or easily accessible? Or is there some other reason? Being specialists in Oral Medicine and Radiology, naturally we feel that we could make a significant contribution in solving some of the oral health problems. However, Oral Medicine and Radiology specialists do not get many referrals from medical practitioners. To know the reason behind the existing scenario, we conducted a survey among the medical practitioners in the city of Pune, Maharashtra. Very few studies have been conducted in India to assess the awareness of dental specialties among the medical practitioners, and almost no data are available regarding the awareness regarding the branch of Oral Medicine and Radiology. Hence, this survey was conducted with an objective to analyze the perceived need and availability of general dentists and specialists in Oral Medicine and Radiology among the medical practitioners. A questionnaire was sent by post to 200 randomly selected medical practitioners registered with the Indian Medical Association, Pune. The same questionnaire was used to conduct a direct interview of 41 medical practitioners in private practice and 25 working at a local teaching hospital. Hence, a total of 266 medical practitioners were approached for the same. The questionnaire consisted of two parts. The first part consisted of general information about the participating medical professionals including their qualification, specialization, and the like. The second part consisted of 20 questions pertaining to the oral and dental complaints the medical professionals came across in their patients, their preferred line of treatment, and awareness among medical practitioners of the speciality of Oral Medicine and Radiology. The identity of the practitioners was maintained anonymous, to reduce any social desirability bias. The data thus collected was analyzed using descriptive statistics. A total of 86, that is, 32% of the practitioners who were approached, responded to the survey questionnaire. Both the general medical practitioners and specialists were included in this. The details of their speciality are included in [Table 1]. The duration of the practice of these practitioners ranged from six months to 43 years. Out of these, 96% of the practitioners mentioned seeing patients with oral complaint(s) other than toothache in their practice. In 40% of the cases, these conditions were reported by the patients as a complaint, whereas, in others they were discovered by the medical practitioners during routine history and examination. As far as referral to the dentists was concerned, 34% of the medical practitioners referred patients with dental or other oral problems directly to the dentists, 60% referred them after prescribing medicines, whereas, 6% of the medical practitioners treated such patients on their own. Regarding the availability of dentists, 61% of the medical practitioners stated that there were less than five dental clinics in the vicinity of their practice. On the other hand, 90% of the medical practitioners were not aware of any specialty dental clinics in the vicinity of their practice. The analysis of responses also inferred that 80% of the medical professionals did feel the need to refer patients with dental complaints to the dentists. However, significantly more number of referrals (60%) are made to a general dental practitioner rather than a dental specialist. The specialties most commonly referred to by medical practitioners belonged to Orthodontics and Oral Surgery. 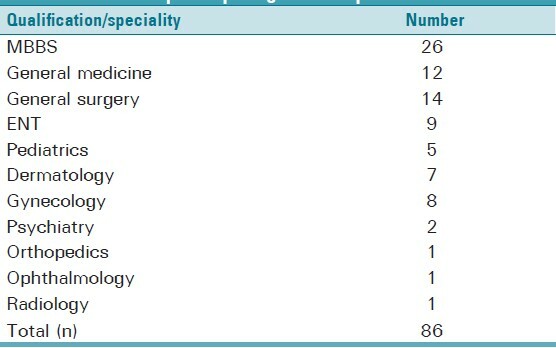 Not a single medical practitioner mentioned Oral Medicine and Radiology in the list of dental specialties, although all of them, at some point, would get patients who would come with an oral lesion as the chief complaint. As many as 72% of them were not even aware of the presence of any such specialists (MDS in Oral Medicine and Radiology), in their vicinity or city. Those (28%) who made referrals to these dental specialists did so most commonly for conditions like leukoplakia, oral submucous fibrosis, trismus, and recurrent ulcers. Dental and medical practitioners both form integral parts of a comprehensive healthcare team. However, the existence of such team work in India is actually questionable. There is a generalized lack of dental awareness among the medical practitioners. , Some earlier studies have shown that a lack of the general medical practitioner's knowledge of oral disease contributes to delays in referral and treatment. This survey was conducted among the medical practitioners of Pune, to know if they felt a need for dental specialists; and if they did, were the dental specialists available to meet their needs. Also, was there awareness regarding the specialists of Oral Medicine and Radiology and their expertise. Results infer that a majority of the medical practitioners do see a reasonable number of patients with oral complaints and do feel the need for referring them to dentists and dental specialists. However, uncertainty about the availability as well as expertise of dental specialists prevails among the medical practitioners. There is poor awareness regarding the different specialities of dentistry and the scenario is especially disappointing when it comes to the speciality of Oral Medicine and Radiology. Very few medical practitioners are aware of the expertise of specialists in Oral Medicine and Radiology, and this clearly indicates the poor referral rates to oral physicians. All medical practitioners get patients with lesions under the purview of Oral Medicine. However, a majority of these are treated by the medical practitioners rather than being referred, which is in contrast to dental complaints for which referrals are made promptly by them. Most commonly prescribed drugs are local anesthetics, antifungals, steroids, and multivitamins. This is not such an encouraging scenario for the specialists in Oral Medicine and Radiology and calls for some serious introspection and a need to increase the awareness of our fellow medical practitioners in this regard. To the best of our knowledge it is probably the only such study done in this region, which exclusively focuses on the need and availability of specialists in Oral Medicine and Radiology, as perceived by medical practitioners. On the other hand our study did have some limitations as well. The poor response to the survey, to some extent, could also be attributed to the use of the postal method for getting the response. Using other mediums like e-mails could probably have increased the response rate. Also considering the busy schedules of the medical practitioners, the questions in the survey questionnaire were limited to 20. A more comprehensive survey questionnaire could have lead to a more in-depth analysis of the present attitude and awareness of the medical practitioners regarding the issue. The overall health of a population can be ensured only if the medical and dental professionals work as a team. However, the findings of this study might infer the lack of integrity of the medical and dental services in this region of India. In another study done by Srinidhi et al. among the medical practitioners of Chennai city, their knowledge, attitude, and awareness of dentistry was found to be satisfactory, and the authors attributed this to several campaigns conducted by dental product manufacturers and various continuing education programs conducted in the city. This clearly indicates that the knowledge and awareness about dentistry as a whole and Oral Medicine and Radiology in particular, in other parts of India, can also be increased by conducting such programs and campaigns. Even though a need is felt, on account of less availability and poor awareness of the expertise, lesser referrals are made to oral physicians. These findings emphasize the need to improve the coordination between medical and dental practitioners. It also indicates the need to improve the general awareness regarding the expertise of specialists in Oral Medicine and Radiology. Some of the strategies that can be employed to improve the current situation are to make effective efforts for campaigns, to educate the healthcare consumers and providers. There is also a need to publicize the specialty of dentistry in general and Oral Medicine and Radiology in particular. This can probably be done by arranging more interdisciplinary sessions and interdepartmental discussions, to improve the awareness of our medical colleagues. Morgan R, Tsang J, Harrington N, Fook L. Survey of hospital doctors' attitudes and knowledge of oral conditions in older patients. Postgrad Med J 2001;77:392-4. Subhashraj K, Subramaniam B. Awareness of the specialty of oral and maxillofacial surgery among health care professionals in Pondicherry, India. J Oral Maxillofac Surg 2008;66:2330-4. Priya S, MadanKumar PD, Ramchandran S. Knowledge and attitudes of pharmacists regarding oral health care and oral hygiene products in Chennai city. Indian J Dent Res 2008;19:104-8. Bailoor DN, Naidu G, Jhingan A, Shukla A, Beohar K. The future of oral physicians -A perplexing enigma? An Indian survey. IOSR J Dent Med Sci 2014;13:71-5. Diu S, Gelbier S. Dental awareness and attitudes of general medical practitioners. Community Dent Health 1987;4:437-45. Wu II, King NM, Tsai JS, Wong HM. The dental knowledge and attitudes of medical practitioners and caregivers of pre-school children in Macau. HK J Paediatr 2006;11:133-9. Patil A, Chavan S, Baghele O, Patel K, Patil K. Awareness of oral health among medical practitioners in Sangamner city - A cross-sectional survey. JIndian Dent Assoc 2010;4:534-6. Sarumathi T, SaravanakumarB,Datta M, Nagarathnam T. Awareness and knowledge of common oral diseases among primary care physicians. J Clin Diagn Res 2013;7:768-71. Srinidhi S, Ingle NA, Chaly PE, Reddy C. Dental awareness and attitudes among medical practitioners in Chennai. J Oral Health CommDent 2011;5:73-8.